A US-led military exercise encompassing troops and vehicles from 13 nations has kicked off in Germany's Hohenfels training area, at a time when NATO forces are holding wave after wave of similar drills. The new war games are a part of the Combined Resolve IV series of exercises, which started May 1 and are set to last until June 26. It is a biannual event in which the US army units stationed in Europe train to act together with their European allies and familiarize the newly-rotated units with the multinational environment. 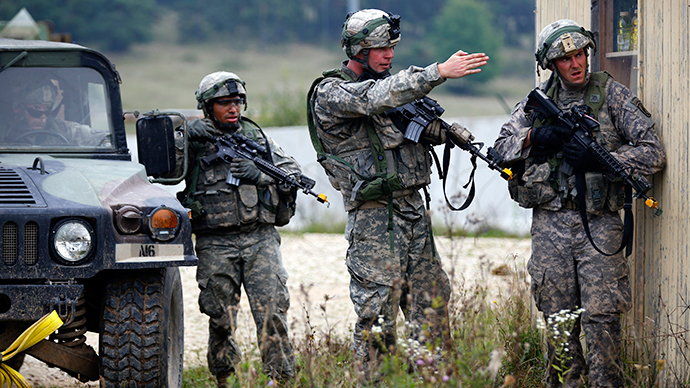 Combined Resolve IV features more than 4,700 participants from 10 NATO members and three allied nations. The exercises utilize various land and aviation military vehicles including AH-64 Apache helicopters, tanks, armored personnel carriers and humvees. One of the commanders involved has told the media that this particular iteration is another message to Russia. "From the Wales summit last September, 28 nations agreed that Russia's occupation of Crimea was illegal and it was unacceptable behavior in the 21st century to use force to change internationally recognized, sovereign borders," US Army Lt. Gen. Ben Hodges said at a briefing. "And so the alliance said we've got to make sure we're ready and that includes being more interoperable." It comes against the backdrop of Atlantic Resolve, which is another massive series of US-led military exercises in Europe. Atlantic Resolve spans most European countries and involves forces from every branch of the Alliance military. NATO’s presence near the Russian border will increase even further, according to a statement by Secretary-General Jens Stoltenberg. Last week at a summit in Turkey he promised "more air policing, with more naval presence and also with more exercises." The alliance has stationed a "high readiness force" in Europe to counteract what it calls a "Russian aggression," as it accuses Moscow of involvement in the Ukrainian crisis. This force is aimed to be about 30,000 strong. It is currently about half that, but Stoltenberg says reaching the force's target size is a "top priority" for NATO. Moscow has repeatedly expressed its concern over the bustling military activity so close to its borders. The number of NATO exercises on Russia's doorstep has doubled over the past year, exceeding 3,000, Russia's envoy to the alliance, Aleksandr Grushko, said in March.